The U.S. Federal Aviation Administration (FAA) announced that the FAA has determined that airlines can safely expand passenger use of Portable Electronic Devices (PEDs) during all phases of flight, and is immediately providing the airlines with implementation guidance. Passengers will eventually be able to read e-books, play games, and watch videos on their devices during all phases of flight, with very limited exceptions. Electronic items, books and magazines, must be held or put in the seat back pocket during the actual takeoff and landing roll. 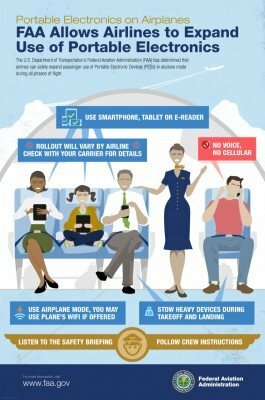 Cell phones should be in airplane mode or with cellular service disabled – i.e., no signal bars displayed—and cannot be used for voice communications based on FCC regulations that prohibit any airborne calls using cell phones.